–A slightly brighter-than-average lady or fellow from virtually every culture in history. We’ve all heard the above epigram, in some form or another, a million times for every mile we’ve traveled. We may have heard it so many times that it’s beginning to ring a little old in our ears. As well it should, as it isn’t a strictly modern sentiment: throughout time, across the world, some clever somebody-or-other has seen fit to coin some iteration of the phrase, and it hasn’t changed a whole lot even as the world has gotten a heck of a lot smaller and our lives have gotten correspondingly faster. So it has staying power, which should tell us that it’s so obviously true that it doesn’t take a rare genius to realize it. However, the very fact that it keeps having to be said tells us the opposite: it’s maybe not as obvious as we would think, or maybe just obvious enough that we don’t think, that we just discard it as a trite but true saying without really examining how it applies to our lives. I was born and raised in Southern California, but I didn’t bother to see much of it until after I moved halfway across the country. The day I graduated high school, I met a girl who, among other things, had a brilliant and infectious love for nature. I don’t mean to say that she adopted stray skunks or anything like that, but she loved hiking, camping, long walks on the beach—no, she really does—and would constantly regale me with anecdotes about her family trips to Death Valley, or Monterey Bay, or some other destination that I had never given much thought. At the end of the summer, I started college at the University of Oklahoma. After a few months, I realized that I had forgotten something, and so I proposed and we were married the next summer. That, you might say, is where my journey started. You see, going places has never really been my thing. I’ve been lucky enough to have some scrapbook-quality trips practically thrust upon me throughout my childhood, so I’ve been to London, Paris, cruises in the Caribbean and in Alaska, American Civil War sites in Virginia, and river-rafting in Idaho. I enjoyed all of these trips immensely, but I never would have thought to go on my own. On my own, I would have been perfectly content to stay at home, exploring imaginary worlds in my video games or in books or movies. This all changed when I married Heather. She noticed things in the world around her that filled me with a stew of awe, love, and jealousy. I began to make an effort to see the world the way that she did. I also began to participate in her family’s occasional mini-trips, three- to four-day excursions to sites within driving distance but far enough away to count as an adventure. It was on one of these journeys, trying to see with the eyes my wife gave me, that I noticed something unusual. We were traveling South along the 5, on our way from Valencia to Vasquez Rocks. Vasquez Rocks, for those who aren’t aware, is a series of jagged, pitted rock formations that have served as the backdrop for Star Trek and various other science-fiction type locales. Jutting skyward at an oblique angle, they do give off a truly otherworldly atmosphere that makes you feel like you’re on the surface of Mars. Except in the middle of July, when we made our trip, you’re more likely to feel like you’re on the surface of the sun. But I’m not here to talk about the destination. I had brought along my new digital camera, and was planning on taking some amateurish but hopefully decent shots of the Rocks. However, as we zoomed down the highway at fifty-five miles-per-hour, I found myself drawing my camera from its case well before we reached our destination. And it wasn’t a cliff or a mountain that drew my eye: it was a convergence of freeways, like rivers coming together to feed the desert, cars sparkling like polished stones, power lines spreading their branches across the vast gap that we, mankind, had cut through the natural countryside. It made me think about what it means to make a journey in this modern age, where centuries of technological and cultural advancement have conspired to make getting from one place to another as quick and as boring as possible. You can travel, via jet, from New York to Tokyo in a matter of hours, and if you’re lucky enough to get a window seat you might see some clouds before the in-flight movie begins. It’s not unusual for students to travel halfway across the country on Spring Break, but it’s usually a matter of straight-line highways all the way there. Even if one were to go from, say, Ventura to Monterey Bay by the longest and most scenic route possible, how would one go? Taking every exit along the highway, just to loop back around? Traveling on foot, sampling a nice variety of sidewalk along the way? Or, like Doc in Cannery Row, you could stop in at every hamburger joint between Monterey and La Jolla. But that doesn’t change the fact that there aren’t any jungles to machete through or rivers to ford in Southern California these days. Such were my thoughts when I first looked out the window and noticed all the cement and asphalt soaking up the summer solar rays. However, by the time I clicked the little digital shutter, my thinking had changed. Humans are going to change the environment: that’s pretty much a given. Sometimes, we’re trying to add something beautiful, and we usually make those changes into destinations: the Arc de Triomphe, the Acropolis, the Lincoln Memorial. Sometimes, we just name something that’s already there, and the act of naming helps to preserve it but also changes it into a landmark, another destination: the Grand Canyon, the Great Barrier Reef, Vasquez Rocks. And the rest of the time, we’re just cutting track, and with the possible exception of Route 66, that never becomes a destination. We hardly even notice it as a journey. It’s a real shame, too, because we’re so preconditioned to think that highways and parking lots and shopping centers are a blot on the environment that we don’t even notice them go by. I was like that: after noticing nothing for years, I was trying so hard to appreciate nature that I forgot to appreciate anything else. 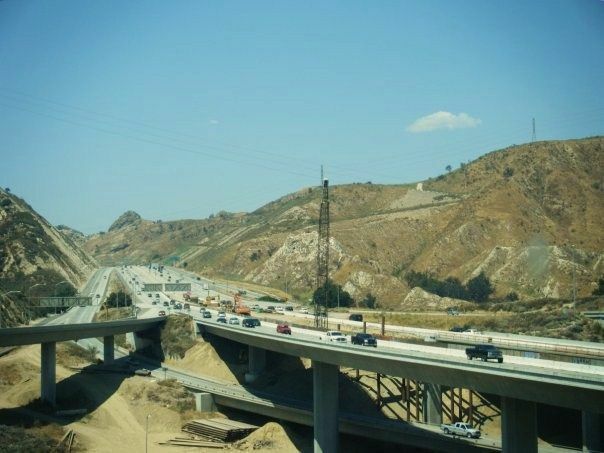 Yet, there is a sort of beauty to the way the freeways snake through the landscape, plowing effortlessly through mountain and cliff and desert. There’s some sort of grace to the way power lines dip and cross beside the highway. And, after all, they’re not going away. Once we’ve dynamited a hole in the world, it’s not going to close back up, at least not in any timespan that matters to us. So, perhaps, instead of decrying the ugliness of the highway, we should focus on making it into a thing of beauty, a thing worth noticing. There are still journeys to be had in this world. We just need to make them. Next Article Next Article Oh, The Places I’ve Gone!